I have a passion for teaching children and believe that all children deserve the opportunity to see themselves in mirror books as well as seeing others in window books. Mirror books give children the chance to see a representation of themselves in a book. For some children, this is not a common occurrence, but when it happens it lets them know that this world is full of people who are just like them. Window books give children another outlook on the world. They may not get the chance to see different cultures outside of their everyday life, but through window books, they can travel and see the world. This semester in Language Arts, my class and I have had the opportunity to conduct fieldwork in a third-grade classroom. While in the classroom, we are in charge of leading the students in Picturing Writing. Picturing Writing is an Artists/Writers Workshop that was created by Beth Olshansky. In Picturing Writing, the students are instructed to paint before they begin writing. There are several topics that can be focused on such as animals and seasons, but our class has been focusing on time of day, sunrise, day, sunset, and night. Each time of day consists of two sessions, one for painting and one for writing. On the first painting day, after a mentor text featuring sunrise, the students were instructed to paint a picture of what comes to mind when they think of a sunrise. The following class, they would brainstorm and write a sunset writing about their picture. They continued this pattern for day, sunset and night paintings and writings. Given a choice, their teacher chose to use King for a Day written by Rukhsana Khan, illustrated by Christiane Kromer and The East-West House written and illustrated by Christy Hale as mentor texts for her third graders day and sunset paintings. Before one of my peers read aloud the book, the students were encouraged to look at each picture and explain their thoughts on what was going on. This prepared them for when they would have to paint by introducing them to pictures of the different times of day. Both King for a Day and The East-West House were either mirror or window books for the students. If there were students who could relate to Isamu Noguchi from The East-West House, who is Japanese-American, or Malik from King for a Day, who is Pakistani, they became mirror books. For the students who were not familiar with these characters and different cultures, they were window books that opened up new cultures to these students. While doing fieldwork I had the opportunity of meeting an African American girl named Carly. Her brilliance was like a light, beaming out of her. She told me that she did not own any books. To me, coming from a house where we owned more books than toys, this news was shocking. While working with Carly on her first writing, sunrise writing, I noticed that she used adjectives such as brown, cool and pretty. I wanted her to go beyond these words, so I formed a lesson plan where she would be able to see both “silver dollar words” and synonyms. The phrase, ‘silver dollar words’ stems from an encounter that Olshansky had. She brought a silver dollar into her classroom and discussed how special and rare silver dollars are versus the common nickel. “I explained that some words, like silver dollars, are a lot more difficult to find than other, more common words. Those words that are harder to find are also a lot more valuable – just like silver dollars” (Olshansky, 2008, p. 78). When I first mentioned the phrase “silver dollar words” to Carly, she laughed. Once I explained what it meant, she began pointing out the different silver dollar words she saw, enthusiastically saying, “That’s a silver dollar word! 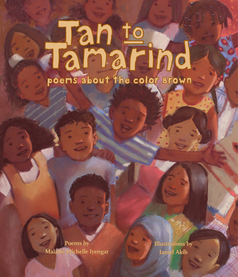 And that’s a silver dollar word!” My lesson plan for introducing silver dollar words and synonyms included the book Tan to Tamarind written by Malathi Michelle Iyengar and illustrated by Jamel Akib. While reading this book, Carly’s eyes began to grow wider at every turn of the page. It seemed as if this might have been the first mirror book she had experienced for herself. “…I picked up January, february, june or july by Helen Fogwill Porter (1988), which is set in St. John’s. This time the paralysis seemed to affect my lungs. I found it difficult to breathe as I encountered a written version of the St. John’s dialect in a fiction for the first time in my life. I think I was donating my breath to the vivification of the words on the page: ‘I was wondering where you were to’ (Porter, 1988, p. 8); ‘But you can’t believe half what you reads in that thing’ (p. 9); ‘I notice you don’t mind reading ‘em when I brings ‘em home’ (p. 9); and, ‘I was over to Lorraine’s’ (p. 9). The fictional voices rang in my ears in a way entirely alien to my normal reading experience. I could hear a complete environment of local and familiar voices suddenly represented on the page. If I were to sum up my response to this story, it would always be the same grateful astonishment at the vividness of recognition that it offers me…” (p. 176). Mirror books have the ability to bring people back to where they came from and incorporate part of that into their current lives. For Mackey, the language reflected in January, february, june or july by Helen Fogwill Porter (1988) brought her back to her home’s dialect. Sometimes all students need is to recognize that where they come from and who they are is important too. It is known that children’s reading and learning is improved when they become engaged and want to learn, but sometimes the question is, “How do I get this student engaged?” I found my answer to that in Tan to Tamarind. Carly’s engagement grew as I turned the pages of the book and she saw more and more of herself on each page. I had only planned to read a couple poems, but once I saw how interested Carly was, I continued. When I finally closed the book so she could work on her writing, she excitedly asked, “Can you bring the book back next class?” Of course, I did. Anna Nardelli is a junior at Mount Saint Mary College in Newburgh, New York. She is a history major from Hopewell Junction, New York and is earning her certification in early and elementary childhood. I am so thrilled to see an aspiring teacher so in tuned with the importance of culturally responsive books that mirror the experiences of all children. 3rd Grade is such a critical year for literacy instruction! I read an article today about how Jason Reynolds didn’t like reading until he was 17, largely due to the fact he didn’t see himself in the books he was required to read in school. May you meet many children like Carly in your teaching tenure and continue to inspire them. Great article.